The blog is a month old (or it was yesterday, maybe the day before…I lose track of things) and in an incredible turn of events (which is likely to THRILL my mother) if you type “Harlot” into Google, I’m the 4th hit. Right under some latex fetish stuff. You don’t even need “yarn” or “knitting” or “Stephanie”. Just Harlot. In an even more incredible turn of events, Joe says that he likes that. Odd as fish. from a wildly successful yarn trade with e-friend Sam, I just about lost my mind. 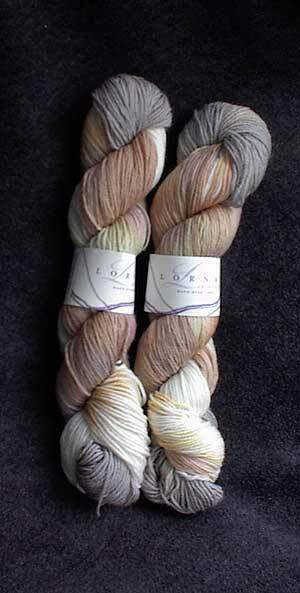 It’s Lorna’s Laces sock yarn “Aslan”, and it’s very, very good. I’ve been coveting this yarn for a long time, but I haven’t seen it around here. When I got the yarn I realized that e-friends are probably the second coolest side effect of blogging…you know, right after being ranked the worlds 4th google harlot. I was so excited when this yarn arrived that I made a classic error. I unwrapped the yarn, and looked around for someone to show it to. As usual, the cat ignored me (my old cat used to feign indifference…Millie actually is indifferent) so I ran upstairs, bounded into our bedroom and woke Joe to show him the yarn. I know. It sounds like such a mistake now while I’m telling you, but at the time it seemed really right. When he had managed to become awake enough to manage speech, all he did was stare at me in a fuzzy confused way and say… “Are you seriously waking me up to show me yarn again?” I may be a slow learner, but that’s when I figured something out. Joe doesn’t want me to wake him up to see any yarn. Not even really great yarn. See, I keep thinking that the reason he didn’t want me to wake him was because the yarn wasn’t good enough to justify it. Therefore, if the yarn that I want to wake him up with is much better than the yarn I woke him up for last time, I think that he is not going to mind. Now I understand that there is no yarn that he thinks is worth waking up for. Weird eh? Poor Joe he just doesn’t get the excitement – his loss! Cool that according to Google you’re a prominent harlot What a riot! There is no understanding husbands. Mine wouldn’t be that nice about being woken up. The only interest he ever shows is to once in awhile ask what I’m knitting….he doesn’t really want to know, its like saying “you sure look nice today” he hasn’t looked at me, but he figures its time to win brownie points. Also, he figures if he asks and pretends to be interested I won’t bother him when he’s watching football. I agree about the sock yarn. Of course all wool is seductive, but sock yarn is in a class by itself. We took a holiday for 6 weeks and the only souvenir I brought back was Wilde sock yarn. Just think, you aren’t just #4 locally, you are #4 as a world wide harlot! Bet you never thought that would happen when you sat in grade 11 guidance class. Congrats! Here’s how I finally got this lesson into my head: I think of all the things DH could wake me up over which I would not care to share at that particular moment. The mind reels, but he does do a good job of acting interested in yarn when fully awake. I’ve recently converted my husband into a knitter, which is great, but he still doesn’t understand my affinity–no–great, passionate love–no–perhaps unhealthy obsession with yarn. That’s actually kind of nice too since I can just give him any old thing from my stash and he’s happy. And yes, he does still get annoyed if I wake him up to show him great yarn, dang it! That is astonishingly beautiful yarn. I love the name – not “lion”, not “tawny”, no, no! She thinks of the best, most ultimate, lionest lion ever and names her yarn after him. Gotta love it. Oh, and… I always knew you were a world-class trollop. I LOVE sock yarn. I also love instant gratification projects, which is why I love making wash clothes. Dumb, right? But after a minbreak, which included three different yarn stores I picked up 5 different varigated sock yarns. My favourite needles (even though I usually hate small needles) are my US4 that I bought on my honeymoon in Ireland. They’re old school Susan Bates in pink. I use the 365 Stitches a year calander and make tons of funky dishclothes and wash clothes on my trusty US4 needles. It’s such a nice break, especially when doing a time consuming project like a sweater. My husband hand crochets and pretends to be interested in what I’m knitting but only so I’ll feign intrest in his crocheting or woodworking. He still doesn’t get the yarn thing. He is, I have to say, very understanding. When I ran out of space for my stash he didn’t tell me to stop buying yarn, he just got me new shelves. Now that’s a keeper! It appears that you have made a major breakthrough in understanding men. Nice work. Well, no husband is perfect, not even mine. Your post had me speculating how I could be the #1 Google trollop. I love the word trollop, don’t ask me why. Gosh Stephanie you let your husband see your new yarn?? I rejoice when I can sneek my yarn in the house when he is asleep and hope he doesn’t wake up to catch me. I’m with Mary Pat. I got a box today. Miguel asked what was in it, with that “Are you buying MORE yarn?” incredulous, snarky tone. I said, oh, twitter, yeah, that must be my new yarn. Well, it wasn’t! Doh! It was my new PDA case and stylus. So now, he gets to ask again (but only if I don’t beat him home to pick up the mail first), “Did you buy MORE yarn?” And I’ll have to admit that the first one wasn’t yarn, after all. (I bought three different lots on eBay and a pattern.) Think I can get home early enough to catch them all? Me, neither. Sigh. Husbands. i don’t think my husband would want me to wake him up either…but at least he orders an almost equal amount of those darn magic cards as i do yarn! teehee! guess that’ll have to stop one of these days! Does this prove we were right, when as little girls, we thought boys are weird? You are seriously the funniest blogger EVER. I, too, will admit to a ridiculous affinity for sock yarn. And I only have like 4 pairs of socks finished. . . single socks, though. . .
I’m making a pair of socks in Lorna’s Laces right now–and you’ve just given me the colorway of my next pair! I love this yarn! I read this post aloud to my husband. He couldn’t stop laughing and said “exactly!” at the end. Men…can’t live with them, can’t set them on fire. I always look forward to your new posts. Much fabulousness here in Harlotville. I’m so glad that it was the right color choice – it really looks lovely on my monitor. You’ll have to be sure to show the finished socks, too. And yes, I’m still doing the fringe thang.